Some people like surprises, some don't. 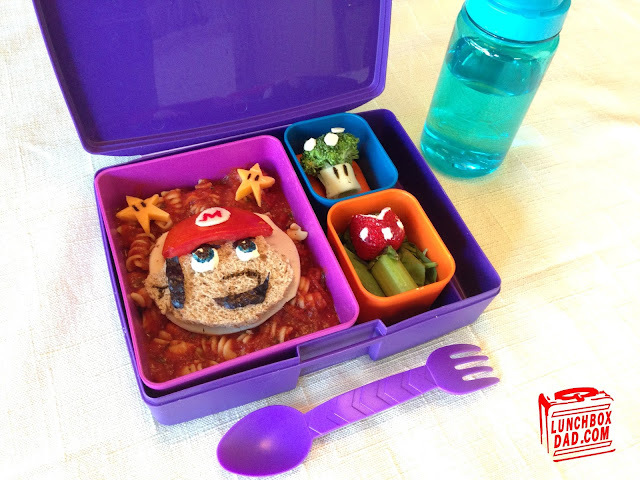 My son loves them so I decided to surprise him with a fun lunch! 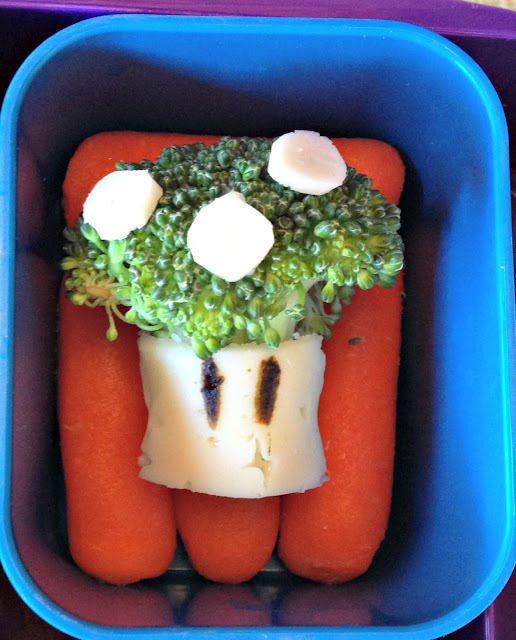 My daughter is usually the one who gets the fun lunches at school but this past Friday was for my son. While my family was at the supermarket last week I picked up all the supplies I needed to make this lunch "super." 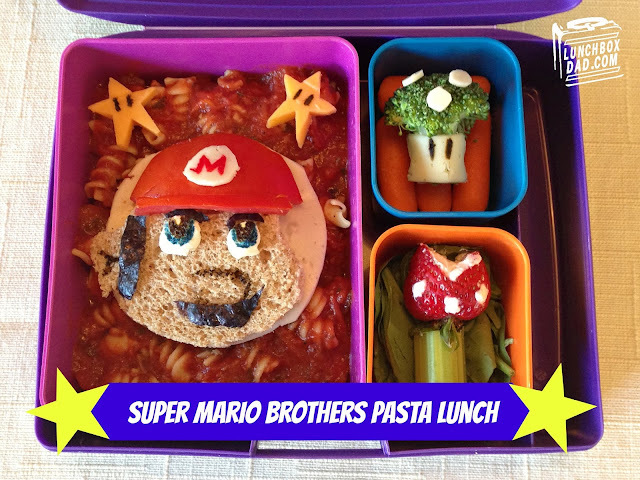 My son had just started to watch the old kids show from the 80's called The Super Mario Brothers Super Show, plus he loves pasta, so I decided that this would be the perfect lunch for him. I made the lunch in a Laptop Lunches lunchbox. I started with some marinara sauce. My son loved it on top of the corkscrew pasta. The sauce was very convenient to make. I chose a container that had easy microwave instructions printed on the side. This made it a snap to make! Next, I decided to tackle making Mario's face. I wanted to use whole wheat bread to make it healthier. I cut a basic face shape out of the slice of bread and used two dabs of fat free cream cheese on for his eyes. A great secret is to use a toothpick to apply food coloring! It works so well and it only takes a second, that is how I did all the facial features. Remember a few drops go a long way. To top it off I cut his hair, eyebrows, and mustache out of nori (dried seaweed). Believe me, I'm no expert I just used some scissors and cut until I thought the pieces looked right. You can do it too! His hat looks tricky but as you can see from the picture below it is just a wedge of tomato with a little circle of white cheese. I used red food coloring to make the "M." The brim of the hat is a skinny slice of tomato. For the "star powerups" I used a little cheddar cheese and cut it into two star shapes with some food coloring for the eyes and placed them as accents in the top corners. I assembled it all, put it on top of a piece of cheese, pasta, and sauce, and I had Super Mario! My son loved picking the pieces off and eating them all separately. I wanted to include some more fruit and veggies, and of course it needed to be Mario Brothers themed. The green "1-Up mushroom" was easy. I just wrapped the bottom of the broccoli in white cheese and used a few small circles of the same cheese for spots. I also used a little food coloring for the eyes and baby carrots for the background. The last part of this pasta lunch is the "piranha plant." All I did was cut a wedge out of the strawberry for the mouth and used cream cheese for the lips and spots. I made the pipe out of celery and used some natural peanut butter for a little more protein. This was my son's second favorite part of the lunch. 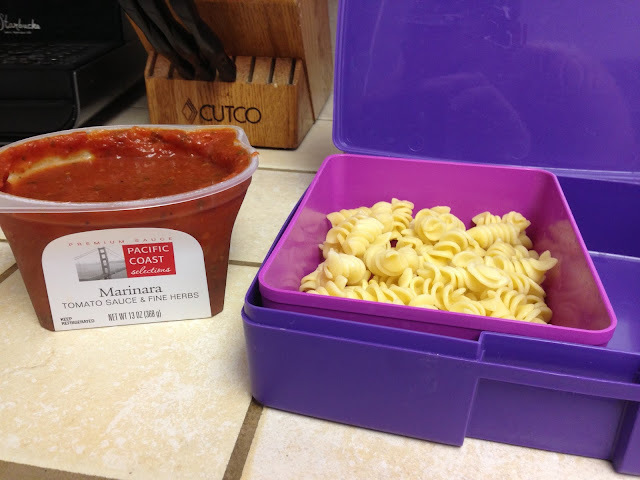 If your child loves pasta then they just might love this pasta lunch. I guarantee they will smile when they open their lunchbox to see it! Great ways to get your kids to eat! Wow! That looks soooo good! Love it! So cute, I love how you worked in the broccoli. Thanks Venia, that might be my favorite part. wtf. This must look like a mess by the time the kid pulls it out of his bag for lunch. You're just playing with your food and pretending its for your kids. 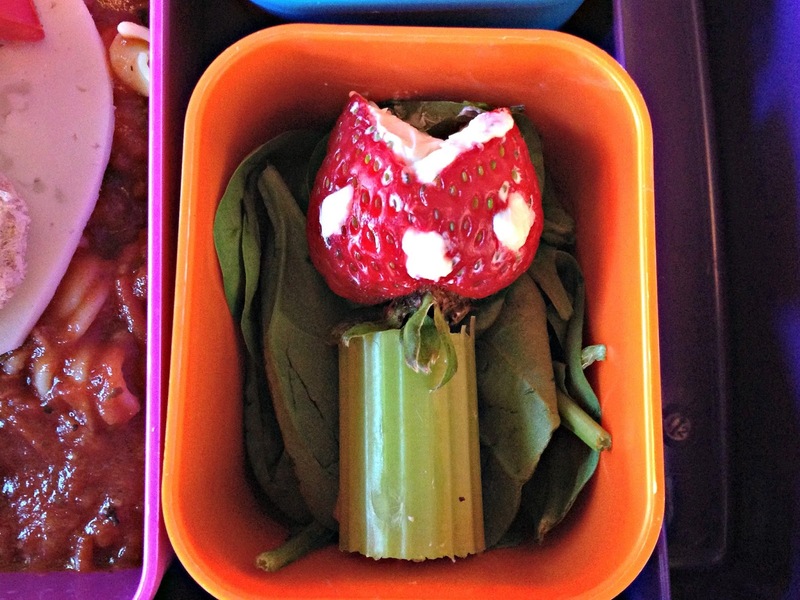 I'm guessing you're not at my daughter's school when she takes out her lunch to back up your point. Thanks for caring though. With this lunch box from laptop lunches each container has a sealable lid so no mess. There are also a couple tricks for getting food to stay in place. This lunch actually stayed very well. Every once in a while it doesn't quite come out as planned, but I can only do my best. Do you have some creative and fun lunches that you make for your kids that you would like to share? I would love to see them. If you think I do this for myself, think again. I love my kids and this is one way I have found to help them feel special and to connect with them. I never talk about the notes I also write my daughter for every lunch because that stays in family. I also post all the recipes and pics here to help inspire other parents and give them ideas. If I did it only for myself I wouldn't bother with that because it takes a ton of time. Thanks for your comment and I don't really expect you will comment again but feel free to email me through my blog here if you want to talk more about some ways to help keep the fun food in place. 1 Year Blogiversary and Giveaway!!! Willy Wonka Lunch for Roald Dahl Day!